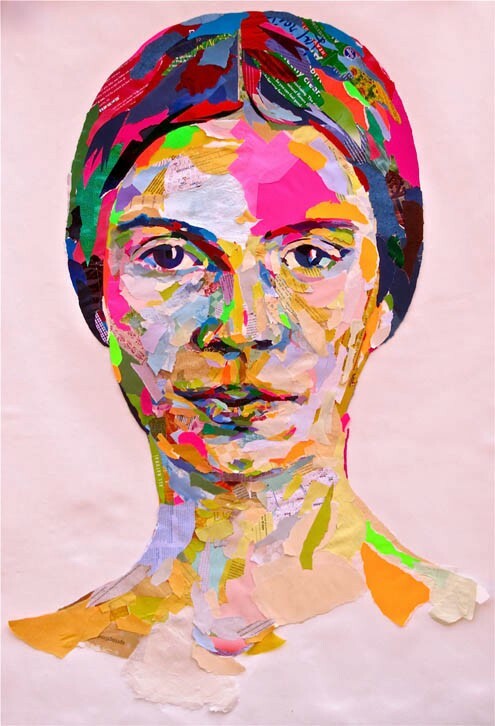 As Emily Dickinson was growing up, she was shy but rather enjoyed social gatherings, complete opposite of her older years. She once said about herself “I am growing handsome very fast indeed! I expect I shall be the belle of Amherst when I reach my 17th year. I don’t doubt that I will have crowds of admirers at that age” (Museum). As she grew older, things started to change some. She began to spend more time at home, as she preferred walks with her dog over social gatherings. By her death, she was positively a recluse from society rarely leaving her home. Dickinson’s childhood and teen years were riddled with many deaths, of friends and family. One of her houses was just right across the street from the cemetery, prompting questions about death (Museum). Once Dickinson left Amherst Academy to attend Mount Holyoke Female Seminary, her ambivalent feelings on religion began to affect her schooling. The school placed her in a category titled “without hope,” as referring to her faith in God as she was truthful about her not wanting to be Christian (Wider 107). Through these often dark events, Dickinson found her voice in poetry. Her most intense writing period being that of 1858 to 1866 in which she wrote more than 1,000 poems (Bomarito and Whitaker 85). I believe the many deaths that Dickinson dealt with were the true driving force behind her writings, and in those her emotions become real and tangible. Emily Dickinson revealed so much about herself and the meaning behind her words through her stylistic choices and penmanship. It is very rare when a mistake is found on one of her manuscripts, I did not find one on the many I researched. Often the pieces seem to be written in a rush — this makes me believe that she had to get the words out and on the paper before they left her. A sudden inspiration would hit and before she forgot, she would write the words down as quickly as she could. Many of the pieces take up full pages of paper exactly, beginning at the top and ending at the bottom of the page, as almost as if she planned the poem to fit on the page perfectly as to gain some sort of satisfaction in completion. Or maybe this is to make the ending of the poem physical as well as metaphorically. I like to believe the pieces were complete before she wrote them, they were already in her head therefore she knew how they would come out. Something very notable about her manuscripts is the emotion that is felt through her writing. Some words have more time spent on them, and depending on their meaning, emotion comes out through them. You can feel the sadness in some of the hurried words, and happiness and love can be felt through swooping letters and accent marks. These pieces were only meant for her eyes, she never wanted her pieces published for the public, let alone her manuscripts to be seen by everyone. To know the meaning behind her writing is personal and for her alone adds so much worthiness to each poem and each word. 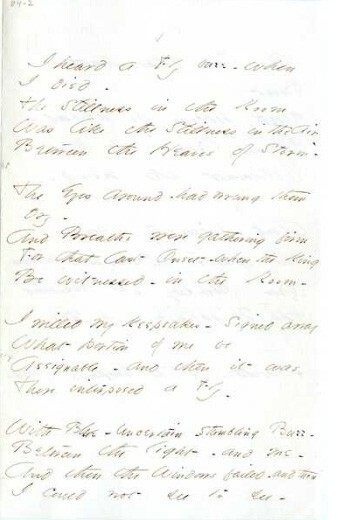 Below are 3 of Emily Dickinson’s manuscripts, and with them are descriptions of possible interpretations of her poems and analytical takes on her manuscripts- mostly focusing on penmanship and word choice. The chosen poems represent two of the most intense emotional factors: death and love. Depression comes in waves for many; Dickinson describes these waves through the beautiful lines of “I heard a Fly buzz- before I died-”. The stillness in the room and in air allowed for such a small sound, a single buzz as we are sitting in between the storms of depression. The penmanship changes on the words “room”, “air”, and “storm.” It becomes more print than cursive, focusing on where the stillness occurs. The second stanza speaks of God coming to take her soul during these storms. A sense of hurry is felt from the style of her writing, almost as if this stanza was not written for her, but only as to please the majority belief of God’s existence. Emily often had questions about faith and her beliefs differed from those around her (Museum). In Christianity, God is to be the saving salvation in dark times. She gives away everything possible to give away, preparing for the death to come. I envision this as Emily giving away the physical items, because those do not matter in the end as they are only possessions. She gives them away because they are a reminder of pain. “Keepsakes” stands out in her writing, I feel trouble in the writing of this word. They are no longer worth the sake of keeping. And here returns the beloved fly, the reminder of the stillness. There is the blue, and all that is in between is the uncertain little fly blocking everything from view. Blue represents the wave of depression coming to hit, the fly serves as a reminder of its imminent return- the stillness in between the waves. Then the light is gone, and the wave returns causing her to be unable to see to see; reason is unreachable in depression, she could not see the reason to see the light. Her writing becomes riddled with deep marks and small jerks, showing the pain of the wave returning. Her known large curls in writing is missing here, I believe the representing a lack of joy, a lack of light. Another intense emotion Dickinson penned about sometimes — love. Wild nights as a luxury with your love. The use of the word “luxury” is so important, it exemplifies wealth and fancy as if better than the entire world. Time with a loved one is what truly makes a person rich. Large swooping lines and beautiful cursive write these words. Happiness is revealed in the penmanship here, the joy of writing these words comes off the page. Pointless, it is to try to sway a heart that has found its home with true love. A compass and a chart cannot help a ship that has already found port, just as the same when true love settles on two people. Dickinson writes “port” with more shortness in her strokes, laying emphasis on this word as it is the home her heart has found. The “port” is her true love. In their love, they have found paradise — the “Eden” as stated in the third stanza. They have created paradise and have the world, as represented by the sea, to enjoy and thrive in their love. The desire to hold on to this luxurious night and the love is strong. “Eden” and “sea” stand out in Dickinson’s penmanship here. She truly felt paradise, as to relate to the ultimate paradise of Eden. The world was felt of this person. “Tonight” has this long accent, highlighting this word as it hold everything in its meaning. It hold her love for this person and this night. This entire piece is written beautifully- the cursive emulating happiness and love as she describes the nights spent with a certain special someone. She even goes as far as to underline the entire poem, adding decorative markings to her private piece and adding meaning to the words. She wants importance to be felt from this piece, even if she is the only one to know of the importance. And we return to the darkness, this time focusing on death again. Death decides on its own when it is our time, few choose this themselves. We normally are not ready to die, but its inevitable and Dickinson knows this. She also knows we are alone with death forever — our only taste of immortality. Our daily lives stop for death, the routine comes to an end. Life continues to move on around us and passed us as we hold our immortality in our graves. Hundreds of years go by, and yet time has stood still for the dead. 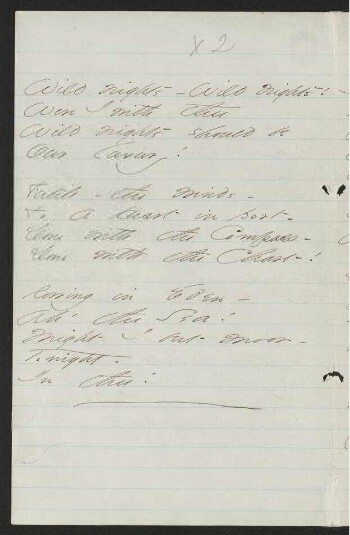 The first page of the poem begins as written pretty clear and legible. The particular word “Immortality” is written beautifully with long accents really pushing her meaning and depth in this word. Her capital letters are large and almost bubbly. She wrote this in a strange mixture of cursive and print. Mostly it is written in cursive, but certain words seem to be written with a different feeling as she changed to print. Consistently throughout the poem letters change their form, noticeably most often with “s” and “e” does this happen. It is almost as if she was rushing to write certain words and taking her time with others. A confusion of acceptance and fear is apparent in her penmanship. She writes beautifully the words that remind her of life and happiness. As the loss becomes more apparent through the poem, the writing becomes more choppy and inconsistent. 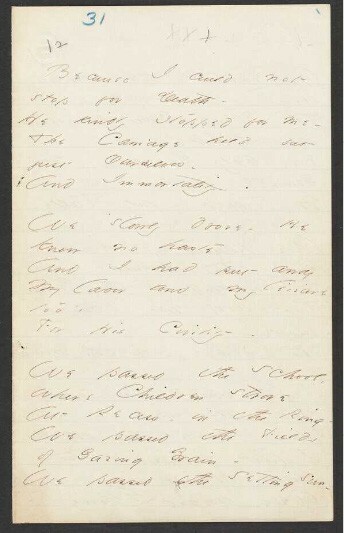 The second page of the manuscript seems to be written not as clearly and a little more chaotic. Here I feel that she was rushing to get the ideas down before they left her, before the words she searched so desperately for left her. She often dots the “i” with a quick mark, a slash almost, instead of a dot. As if she didn’t even have the time to pick her pen up completely before she needed to start the next word. Death can change a person completely, and in Emily’s case I believe that it did. Death changed her life, and in that death was born her talent for poetry. Emotion became more important to her, and expressing these feelings became a priority. More than a thousand poems reveal small hints about her life and her heart, the more we unearth, the more we are able to understand this particular genius of a woman and her understanding of the world that we live in. Nineteenth-Century Literature Criticism. Ed. Jessica Bomarito and Russel Whitaker. Vol. 171. Detroit: Thomson Gale, 2007. p84–233. From Literature Criticism Online. Sarah Ann Wider. The American Renaissance in New England, Fourth Series. Ed. Wesley T. Mott. Dictionary of Literary Biography Vol. 243. Detroit: Gale Group, 2001. p103–127. From Dictionary of Literary Biography Complete Online. 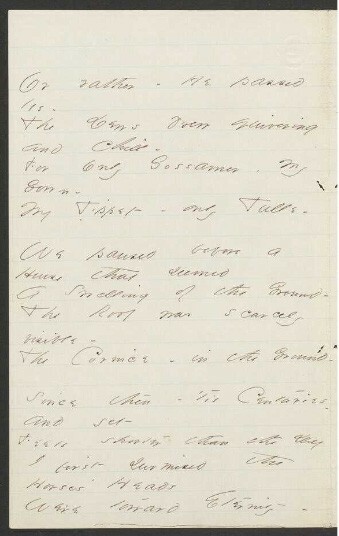 Manuscript pictures found on the Emily Dickinson Archive, links included in captions of the photos.